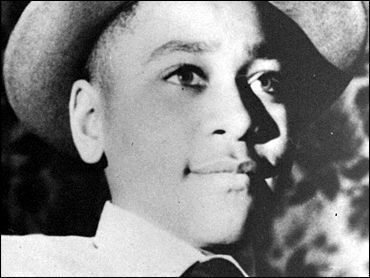 All but closing the books on a crime that helped give rise to the civil rights movement, a grand jury has refused to bring any new charges in the 1955 slaying of Emmett Till, a black teenager who was beaten and shot after whistling at a white woman in the Mississippi Delta. The district attorney in rural Leflore County had sought a manslaughter charge against the white woman, Carolyn Bryant Donham, who was suspected of pointing out Till to her husband to punish the boy for what was a grave offense in the segregated South. But the grand jury last Friday issued a "no bill," meaning it found insufficient evidence, according to documents made public Tuesday. Federal authorities decided last year not to prosecute anyone, saying the statute of limitations for federal charges had run out. Mississippi authorities represented the last, best hope of bringing someone to justice. No one has ever been convicted in the slaying. "You're looking at Mississippi. I guess it's about the same way it was 50 years ago," said a disappointed Simeon Wright, 64, a black man who heard his cousin whistle. "We had overwhelming evidence, and they came back with the same decision. Some of the people haven't changed from 50 years ago. Same attitude. The evidence speaks for itself." Till, a 14-year-old boy visiting from Chicago, was kidnapped from his uncle's home in the town of Money and killed after he wolf-whistled at Donham, a shopkeeper at the Bryant Grocery & Meat Market. Three days later, his mutilated body was found in the muddy Tallahatchie River, weighted down with a cotton gin fan. His left eye was missing, and his right eye was dangling on his cheek. The body was identified only by a ring he was wearing. His mother, Mamie Till-Mobley, who died in 2003, held an open-casket funeral in Chicago, and a photograph of Till's disfigured face in Jet Magazine had a powerful effect on public opinion, letting the world see what was happening in the South. Roy Bryant, Donham's husband, and his half brother, J.W. Milam, were acquitted of the crime by an all-white jury in 1955. The two men later confessed in an interview with Look magazine. Both are now dead. The FBI reopened the case in 2004 but decided in 2006 not to press charges. The case was turned over to local prosecutors, with the FBI suggesting they take a closer look at Donham. Some witnesses said a woman's voice could be heard at the scene of the abduction. David Beito, a history professor at the University of Alabama who has researched the case extensively, said Tuesday there is probably no one else left to arrest in the case. He said it is hard to underestimate the importance of the Till case, which took place the same year as the Montgomery, Ala., bus boycott. "It gave a jump-start to the civil rights movement," he said. "It did not create the civil rights movement, but it made it more into a mass movement. It really mobilized people." Donham, who remarried, is now 73 and has declined interviews. A telephone number for her was disconnected Tuesday. District Attorney Joyce Chiles, a black woman who grew up near where the killing took place, was in court Tuesday and not immediately available for comment. Wright said: "J.W. Milam and Roy Bryant died with Emmett Till's blood on their hands. And it looks like everyone else who was involved is going to do the same. They had a chance to come clean. They will die with Emmett Till's blood on their hands." Horace Harned, 86, a former Mississippi legislator and member of the Sovereignty Commission, a state agency that worked clandestinely to preserve segregation, said he was glad to see no charges filed. He said the suggestions that Donham had a role in the crime are "a bunch of foolishness." "Of course, I don't believe in murder. That's the wrong thing. It always backfires on you. That shouldn't have happened," he said. But he added: "You can't correct all the ills of the past. If we did, the Southerners were treated much worse than anybody back in the Civil War."